Installing a steam boiler system can be a huge headache when you’re dealing with different companies supplying components and leaving you to figure out how to make them work together. 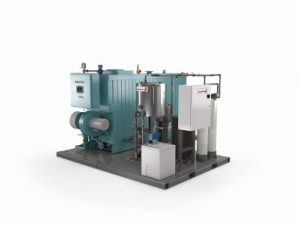 Cleaver-Brooks pre-packaged, skid-mounted steam boiler solutions offer a simple way to get up and running in less time, with less effort, than you might imagine. To request a proposal for a skid package, please contact us. 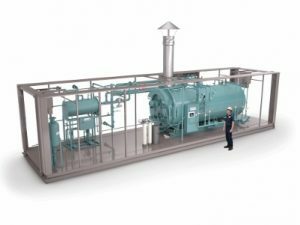 Cleaver-Brooks offers standard and complete steam boiler system skid-mounted packages in gas and propane fuels. The package includes the steam boiler, feed system and blowdown separator with optional chemical feed system and water softener. Cleaver-Brooks designs and builds standard-size and customized skid-mounted and containerized systems utilizing 3-D modeling to ensure optimal performance. Maintenance is made easy with specially designed access to each unit on the skid. Cleaver Brooks offers their ClearFire boiler packages as horizontal or vertical skid configurations. 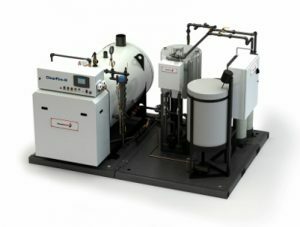 Being pre-engineered and assembled for streamlined operation, these systems are also designed to be adaptable, with additional boilers or accessories completely customizable.